Looking for a great, low Points Dessert Recipe? Try this delicious Blueberry Tart, and you’ll swear you’re not dieting. Full of flavor and healthy fats, this dessert actually packs a pretty powerful punch when it comes to nutrients. If you’re going to eat dessert, why not eat one that’s actually pretty good for you and chock full of vitamins and antioxidants? With just 4 Points per slice, you can enjoy a super yummy dessert that’s made with REAL ingredients…not artificial sweeteners. It’s creamy, sweet, tart and absolutely decadent. Serve it as a treat for the family after dinner, or take it to a potluck and impress all your friends and family with your incredibly delicious and HEALTHY dessert!! Whisk egg white in a medium bowl until frothy. Add the crumb mixture, butter, oil and salt; toss to combine. Press the mixture into the bottom and 1/2 inch up the sides of a 9-inch removable-bottom tart pan. Set the pan on a baking sheet. Bake until dry and slightly darker around the edges, about 8 minutes. Cool on a wire rack. To prepare filling: Beat cream cheese, yogurt and 1/4 cup maple syrup in a medium bowl with an electric mixer on low speed until smooth. When the crust is cool, spread the filling evenly into it, being careful not to break up the delicate crust. 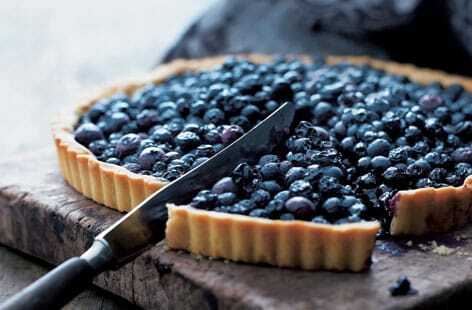 Arrange blueberries on the filling, pressing lightly so they set in. Chill for at least 1 hour in the fridge. I haven't tried it myself, so I couldn't say for sure, but why not give it a try!? Make sure to let us know how it goes! I love blueberries so much, or any berry for that matter. Plus, I absolutely adore tarts. So, this is a perfect match for me. I’m definitely going to try it. I'm confused. The title says 4 Points+ and the recipe says each serving = 5 Points +. So which is it? Also, the picture shows a slice of – what? – 1/6 of the tart, but the recipe calls a serving 1/12 of the tart. This seems a little misleading. The photo is just for reference…..it's not meant to show an exact serving size of the tart. As for the Points +, it was a typo, and I've since corrected it. Thanks! Looks so good! And blueberries are so good for you. One question though, in the directions, it says 'beat cream cheese and sour cream…'. I assume you meant cream cheese and the greek yogurt? Just wanted to make sure I have it down right. :) Thanks for all the great recipes! Yep, you are correct…it's supposed to read yogurt in the instructions. I've since corrected it. Thanks! !